The good, the bad, and one bizarre browser game. Game of Thrones is possibly the most watched TV show in the world—assuming as many people lost interest in The Walking Dead as we did—and returns on Sunday to HBO in the United States with its final episodes. It has the strange distinction of spawning many games without more than a couple being of any value at all, even though an open world-style RPG set in that universe seems like such a no-brainer. 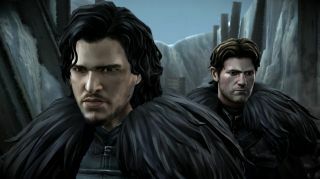 Still, if you're curious, below we've rounded up all the Game of Thrones experiences you can find on PC, which together cross a surprisingly wide array of genres. If this slightly disappointing array of Westeros adventures don't do the trick, consider checking out our list of the best Game of Thrones mods, where hard-working modders have transplanted that universe to a bunch of superior games. The 'A' at the start of that title indicates that this strategy game was based on the books, rather than the TV series. Given that it was released in September 2011, though, a few months after the show premiered, there's a slight whiff of opportunism about the timing. Currently sitting with mostly negative reviews on Steam, Dan Griliopoulos gave this a 62% back in 2011, citing an overly long and incoherent campaign, with slightly more praise for the skirmish mode. "When you play the game of thrones, you win or you die. There is no middle ground. This... dies." This Telltale title came when the developer's cachet was at an all-time high, and it's not quite regarded as its best work, like Tales From the Borderlands, season one of The Walking Dead, or The Wolf Among Us. It's true enough to the show's look, and even features some of its cast. The game follows House Forrester, who are adjacent to the events of the show. Leif Johnson's review called them out for being too similar to the Starks. Still, it features plenty of death and betrayal, which is at least thematically spot-on. "Game of Thrones gets the feel of Martin's universe right, but it relies too heavily on familiar themes to form a memorable identity of its own." The only RPG to come out of Game of Thrones, not counting tabletop ones, is this half-hearted attempt from Cyanide, the studio that also made Genesis. Westeros is fertile ground for roleplaying, and to Game of Thrones' credit it does spin an interesting yarn about a priest of R'hllor and a member of the Night's Watch. It's two fresh perspectives on a familiar world, running concurrently with the first season but generally self-contained. Unfortunately, it's let down by a bland art direction, dated graphics, forgettable fights and inconsistent writing. Lots of wasted potential. A cheeky take on the Game of Thrones story that bundles the series’ complicated political wranglings in an accessible, Tinder-inspired format. Reigns is technically a sequel to Game of Thrones that casts you as the winner of the Iron Throne. The game presents you with binary decisions and asks you to swipe left or swipe right to decide an outcome. Your decisions accumulate quickly until sudden shifts of power take place. Don’t expect everyone to survive. It’s a reskin of the original Reigns, which took place in a fictional kingdom cooked up by the developers. There’s extra weight to your decisions when you’re dealing with Cersei and balancing the needs of your citizens against your desire for power. Ahead of the final TV series the developers have added 200 new cards to deepen the game further and give players a more complete GoT experience before the show finally ends.